Sacred Odyssey: Rise of Ayden is an RPG gaming app that follows an epic hero on his journey to fulfill his legendary prophecy. 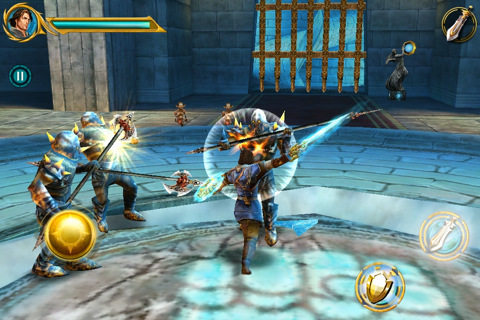 The game was released by Gameloft for an iPhone (3GS or 4.0), iPod Touch (4th generation), and iPad and it will not cost you a dime, at least initially. The game reminds me of a Lord of the Rings and King Arthur hybrid. Our hero, Ayden, awakes from a dream in which he was being summoned for greatness to realize he is a farmhand in medieval England. The way the game works is that you get clues from people along the way to figure out what our player is destined to do. Apparently his father was a great warrior and protector of his people who died in the war and now he has to step into the role his father once had by using his sword and shield to fight off Kobolds among others. 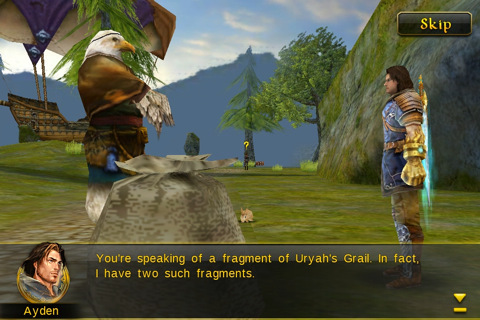 You can skip the commentary or use it to enrich your gaming experience. Whether you pay attention to the story line or not, you get tasked with missions and upon completion you are generally given something valuable that will help you with your next assignment. At the outset you can either choose to play the full game or just a mini game that is not has time-consuming. A feature that I absolutely love about this app is the ability to access your iPod playlist from within the app under the Options section; you get full control of your listening with the ability to play/pause, and skip forwards and backwards. The controls are manageable and the overall game play is user-friendly. Once you install Sacred Odyssey, experience it, and decide you want more, you can buy the complete game with an in-app purchase of $6.99. I was surprised at the amount of detail that went into Sacred Odyssey. The game is free yet runs seamlessly and offers a variety of challenges that have been laced with entertaining story telling. I appreciate app games like this one because it proves that you can get real quality these days without having to pay top dollar. AppSafari review of Sacred Odyssey: Rise of Ayden was written by Vanessa Paszterko on February 10th, 2011 and categorized under Action, Adventure, App Store, Fighter, Free, Fun, Games, Music, RPG. Page viewed 5710 times, 1 so far today. Need help on using these apps? Please read the Help Page.